I’ve been wanting to include a pizza recipe made from scratch on my blog for a long time. Why? Because I can eat pizza everyday! Is there any foods or beverage that you can eat or drink everyday? For me, it's pizza and coffee. I've been going back and forth on whether I should include a pizza recipe because it breaks a few of the rules that I have on the site - 30 minutes or less and fewer than 10 ingredients (mostly that is). Admittedly, I have been breaking these rules as of late, but one thing is true: all the recipes are easy and instructions are straight-forward, so prepping the ingredients is pretty quick (at most 30 minutes), and the majority of the total time is waiting for the food to bake, cook, or roast. and how to reduce balsamic vinegar to make a thick balsamic reduction. All these mini recipes with the instructions and tips can be applied to so many different recipes, especially the pizza dough. Think of all the pizza that you can make or all the pizza topping possibilities. Also think about simply serving the sautéed mushrooms and leeks as a great vegan side dish. The balsamic reduction is also amazing on salads, appetizers, meats, and even on desserts! Let’s breakdown what’s in this delicious vegetarian pizza! Simple crust: Thin crust that’s crispy and lightly browned on the outside and soft and chewy on the inside. Cremini (aka crimini) mushrooms: Coffee-brown in colour with earthy, deep savoury flavours and a meaty texture. Leeks: The light green to white edible part of this vegetable taste like a sweeter, more mellow onion. Cheese: Two types of cheese in this pizza: parmesan (Parmigiano-Reggiano is preferred), which is rich in umami flavours (a little nutty and sweet too), and fresh mozzarella, which is soft, milky, mild in flavour, and perfectly melty. Did you know that not all parmesan cheese is vegetarian? If you are on a vegetarian diet, look for parmesan that is free of animal rennet. Instead, look for parmesan that contain vegetable rennet or microbial enzymes instead. Balsamic vinegar: When reduced in a saucepan, it becomes thick and full flavoured with sweet, tangy, and sour notes. Basil: It’s fresh, slightly sweet, herbaceous, and aromatic. Extras: Salt (and black pepper) enhances the flavours of the other ingredients, the red pepper flakes adds a little spicy heat, and the dried oregano is woody and robust. I hope you like this one! Let me know if you have any questions or comments below. If you make it, please send a message or picture to any of my social media. Combine the pizza dough ingredients according the "Instructions" listed below. Cover and let the dough rise (proof) for 30 minutes at room temperature (or warm place like the oven). As the dough rises, saute the leek and mushrooms until tender and liquid is evaporated. Balsamic vinegar is reduced in a small saucepan until it is thick but pourable. Dough is flattened into a crust and the toppings are added right on a parchment paper-lined baking sheet. Bake for 15-20 minutes (turning the sheet around once) until the crust is cooked through and the cheese is melted. 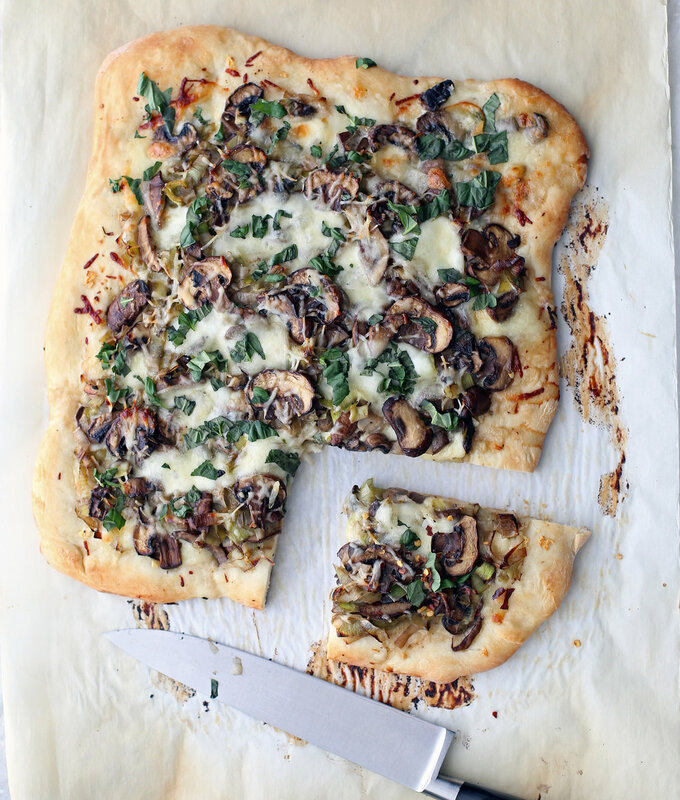 No pizza stone or pizza pan required! After the pizza is ready, top the hot pizza with more salt and pepper, fresh basil, dried oregano and red pepper flakes if you like! Drizzle with as much balsamic reduction as you want. What other toppings would you add? In the bowl of a stand mixer fitted with a dough hook, place the yeast, warm water, sugar, and 1 tbsp of oil olive. Gently swirl the mixture for a few seconds before letting it sit until the mixture is foamy, about 10 minutes. Add the flour and salt and mix at medium speed until the dough is smooth, about 3-4 minutes. Place the dough in a large bowl that’s lightly oiled with olive oil and knead the dough a few times to form an even round ball. Cover with plastic wrap and let it rise in a warm place for 30 minutes*, until at least doubled in size. While the dough is proofing, heat a large frying pan to medium-high, add one tablespoon of olive oil, mushrooms, salt, and pepper. Saute the mushrooms until liquid is removed, about 10 minutes. Then add in the leeks and stir occasionally until leeks are soften, about 3-4 minutes. Set aside. Heat the oven to 450 degrees F and line a large baking sheet with parchment paper. Lightly flour a flat, clean surface and using floured hands, knead the dough for ten seconds before gently flatten the dough, until you get your desired crust shape of about ½ - ¾ inch in thickness**. Spread the remaining 1 tbsp of olive oil and minced garlic over the dough before placing ¾ of the mozzarella slices and ¼ cup of parmesan cheese on top. 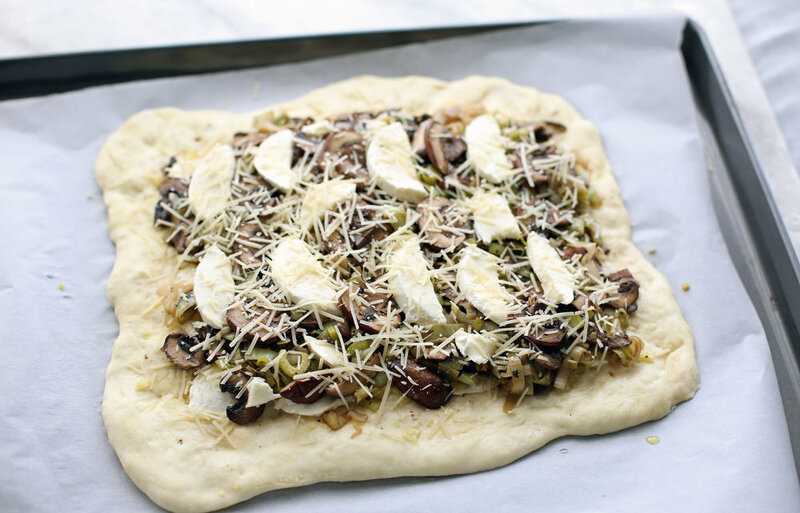 Next, add the sauteed mushrooms and leeks before finishing with the remaining mozzarella and parmesan cheese on top. Bake for 15-20 minutes, rotating the baking sheet halfway, until the crust is lightly browned and cooked through. As the pizza bakes, in a small saucepan, pour in the balsamic vinegar, bring it to a light boil, and then reduce the heat to a simmer, stirring frequently until thickened and reduced by almost half, about 3-4 minutes***. When the pizza is out of the oven, drizzle the desired amount of balsamic reduction on the pizza. Season with additional salt and pepper. Sprinkle with fresh basil. Optionally top with dried oregano and red pepper flakes. Best served immediately. *I like to cover and let the dough rise in the oven at the “warm” setting. Some ovens also have a “Proof” setting that can be used instead. You can also heat the oven to its lowest temperature (usually it’s 200 degrees F, turn off the heat, and then let it rise in the oven with the oven door slightly open. Or you can place it in a warm spot at room temperature. **You can also use a floured rolling pin if you like. I ended up with a 10 x 12 rectangle. ***If the balsamic is too thick, heat it back up (medium-heat), add a small amount of balsamic vinegar and stir until it thins to your desired consistency.